Something has been happening in the global economy this year - and I say *this year* for good reason. 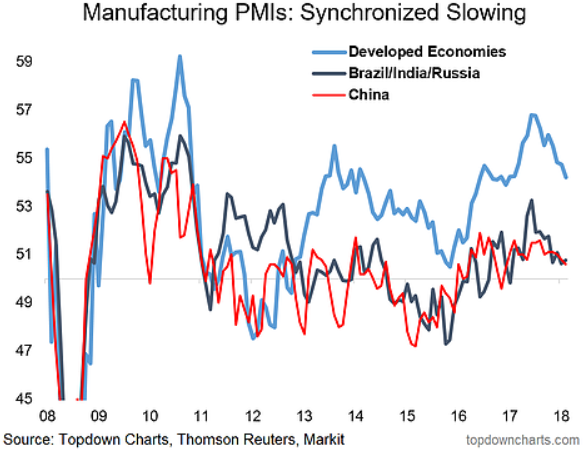 Both the developed and emerging market composite manufacturing PMIs peaked in December last year, and have both seen an almost consistent and synchronized slowdown. We can definitely blame tighter financial conditions and increased market volatility, but political risk is also a key issue, with the escalations in the trade war having a clear negative impact on corporate sentiment (we see this with specific reference to uncertainty in the comments of the surveys). So you have a real and pressing threat (tighter monetary policy/financial conditions), along with the sentiment effect of market volatility and headline risk. This means there is a risk of things spiraling down from here, but the sentiment aspect also means that at least part of the slowing could be a false signal in terms of how it relates to real activity. Indeed, with the higher frequency real activity indicators we monitor there have been no signs of imminent collapse, although there has been some slowing. So, for now, a vigilant, yet optimistic stance is justified. Read next: Will the Trade War Derail the Longest Bull Market in History?